This diagram illustrates the “catastrophic” consequences of a possible “cascading failure” of the Murum and Bakun Dams. It comes from the official Environmental Impact Assessment report submitted to Sarawak Energy in 2008, but kept secret till now. 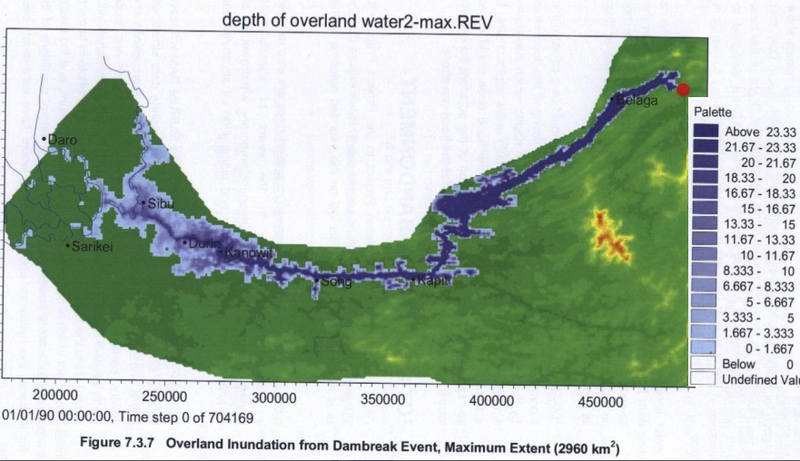 A wall of water travelling “at high speed” is shown as having inundated nearly three thousand square kilometres of the Rajang River basin, in a disaster of Biblical proportions. It would hit Sibu within a few hours and wipe out everything in its path. The waters would remain for several days, according to a series of official charts that detail an unfolding disaster in the event of a dam break. 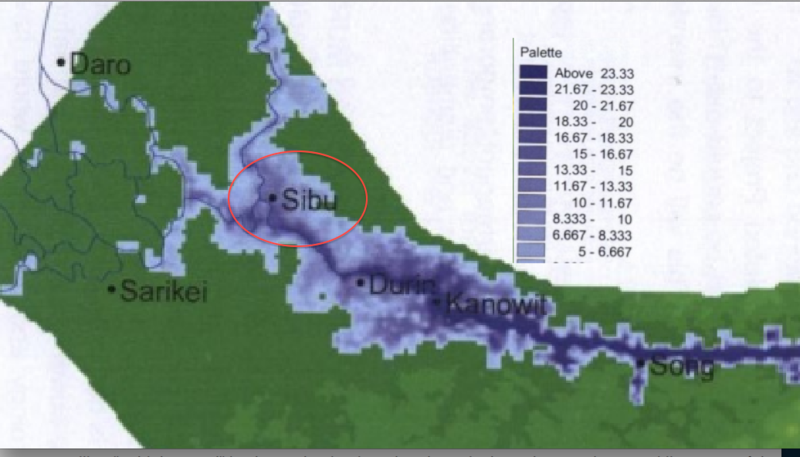 The charts shows that even in Sibu the flood is calculated to be around 15 meters high and further up the Rajang river basin the wave is calculated at tens of meters in height. The region is home to well over half a million people. 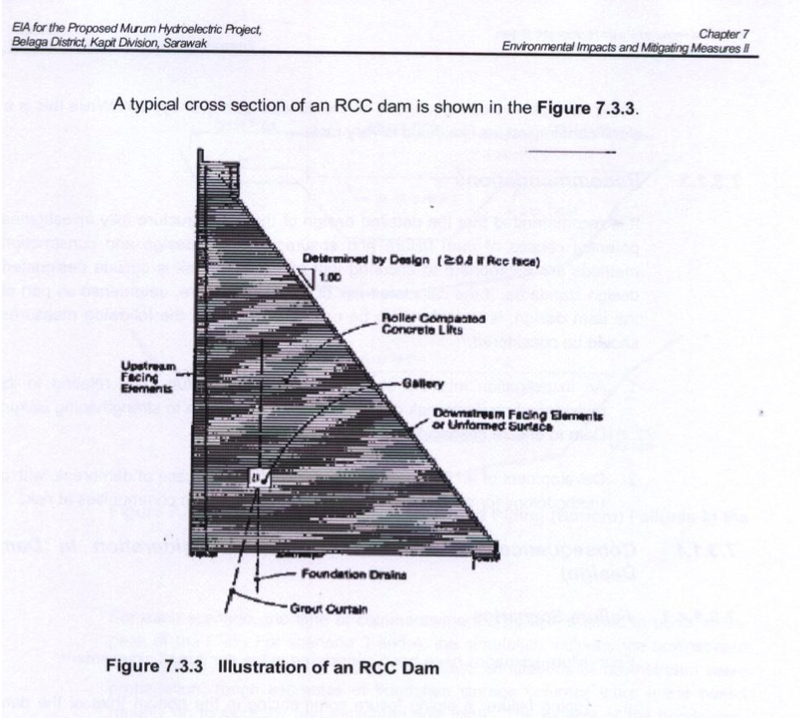 These diagrams are part of a series contained in the till now hidden Environmental Impact Assessment, which NGOs have long campaigned ought to have been made public. They have rightfully pointed out that, according to the World Bank safeguards and all other standard protocols, Environmental Impact Assessments should be made public, so that the public understand the implications of major projects such as this. 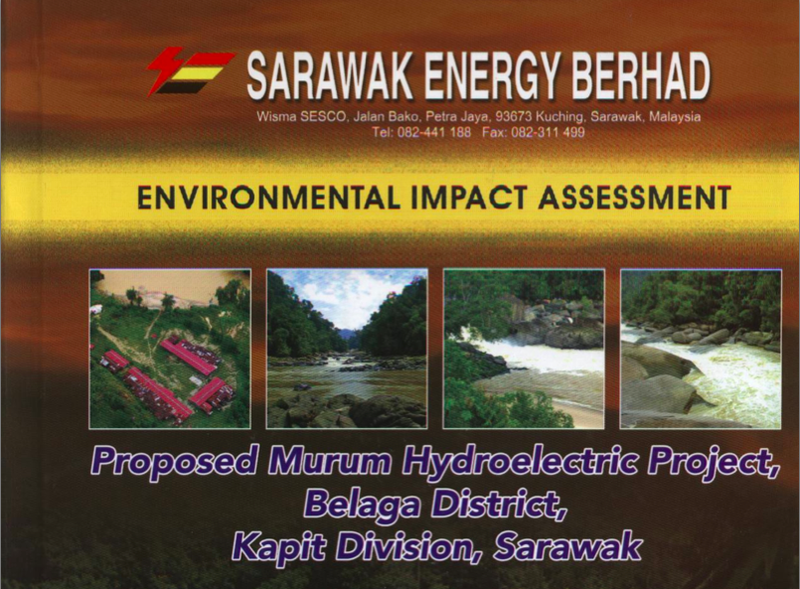 Sarawak Report has tracked down the Impact Assessment Sarawak Energy refused to make public. The EIA on Murum is a comprehensive and professional document, according to experts. It was prepared by the Malaysian company Chemsain Konsultant Sdn Bhd back in 2008, but only after it was discovered that the then Chief Minister, Taib Mahmud and China’s Three Gorges Dam Company were already blasting tunnels through the rock face at the Murum Gorge. 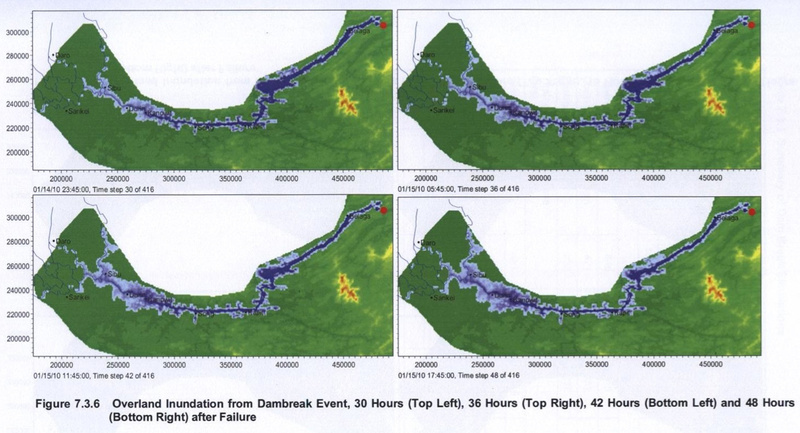 What the EIA reveals is that the positioning of Murum Dam has added to the risk factors inherent in the Bakun Dam, which is the world’s second tallest rock filled dam. Murum is located 70km directly uphill from Bakun and is linked by a narrow high gorge straight into the now flooded Bakun Lake, which crouches over one of Sarawak’s most densely populated areas - the whole Rajang River basin. The matter is dealt with in Chapter 7 of the report, which Sarawak Report has now obtained in full. 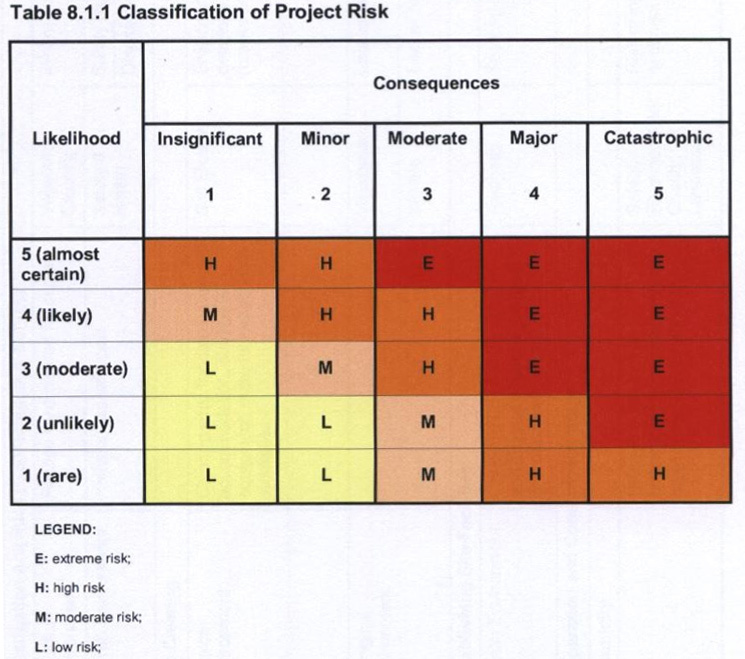 Report classifies project as “high risk”, because even though change of failure is unlikely, the results would be so catastrophic. Was the added risk of a “cascade effect” factored in? Bakun was built before the added risk of the Murum Dam was introduced upstream. 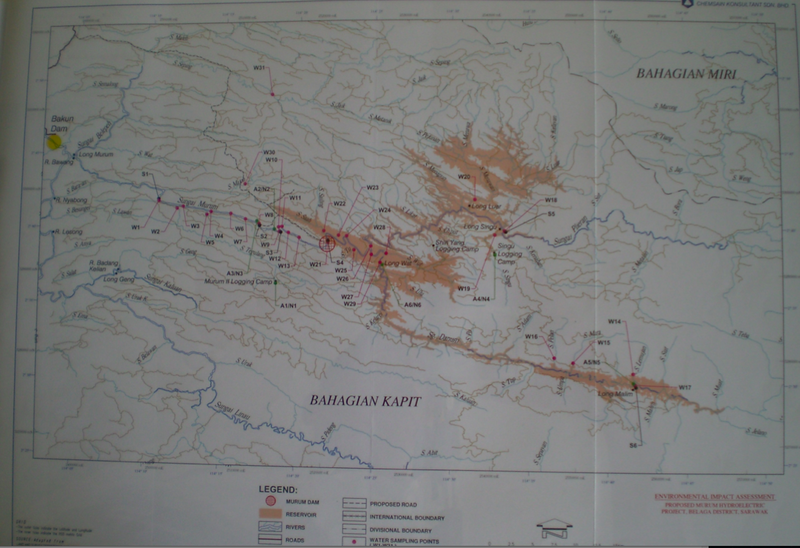 Likewise, Murum itself was begun on the whim of the despotic Taib Mahmud before an environmental impact assessment into the possible risks had been carried out, which means that its ultra-sensitive position as a potential trigger behind a Bakun collapse was probably not taken into account into its design either. The 2008 IEA, therefore, proposes three crucial recommendations to counter the enhanced risk created by the added danger of cascading failure. Where is the Emergency Action Plan? Sarawak Report therefore questions SEB as to whether any of these three key recommendations in their own EIA report were ever carried out? 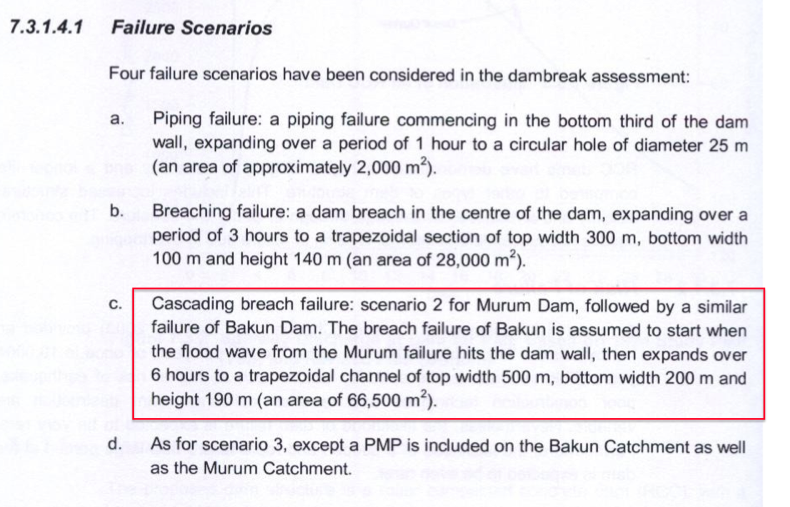 If so, where is the Emergency Action Plan to rescue the people down river and why, six years after this report, has there been no public announcement of any form of Emergency Action Plan, even though Bakun is now full and Murum is being filled? Are Sarawak Energy and the Sarawak State Government so uncaring of its people that they have been willing to hide this embarrassing IEA, rather than going public to admit that everyone living down river should now be forced to learn what to do the moment there is a warning of a possible breach at Bakun? In many cases an early warning could give communities a few valuable hours to get out of the way of a roaring wave bearing rocks and debris that would surely obliterate every living thing in its wake. Yet what sign is there of any such escape plan having been devised for any of these communities? Did Taib Mahmud simply not care enough to warn his citizens? Or is CEO Torstein Sjotveit’s recent announcement that “Murum Dam is completely safe” to be still accepted at face value and without question? There are other reasons why SEB and the BN government would have wished to cover up the Murum EIA, because this document, which Sarawak Report has obtained in full, makes perfectly plain that the purpose given for the dam by the IEA was false. Although by 2008 it was well known that technically the Bakun Dam could not transmit its electricity undersea to West Malaysia, the Murum IEA still justifies the building of the further Murum Dam on the false premise that all the electricity from Bakun would be used by West Malaysia! The Statement of Need was never published – if it had been people could have pointed out that Murum was not needed! In fact Bakun was just last month admitted to be only running at 50% of its enormous capacity with even the ambitious industrial projects of SCORE unable to utilise its output. This means Murum is not needed by Sarawak and nor are the 15 further dams proposed under Taib’s eccentric programme of ‘industrialisation’. No wonder the Murum IEA has been covered up! Taib Mahmud’s family companies are making far too much money out of the construction of these dams, using money borrowed on behalf of the state for him to willingly relinquish these projects – and Adenan Satem does his bidding. Sarawak Report is concerned that the secretive Murum Dam has been a project led by novices and controlled by a corrupt and over-powerful politician, Taib Mahmud. Indeed Murum is the first major overseas dam to be completed by the Three Gorges Dam company outside of China and it was commenced in secret, after a deal between Taib, his brother in law Abdul Aziz Husain (the then CEO of SEB) and the Chinese State Government, using a loan from China. The Three Gorges Company is a still relatively new state-company, which benefitted from the transfer of technology from the western companies, which assisted Three Gorges in building the highly controversial dam on the Yangtze River. Now it is trying out its newly acquired skills on countries like Sarawak and there have been plenty of problems, like the collapsed diversion tunnel and the sub-standard turbines, which were found not suitable for installation, but have been installed anyway. So, is SEB’s complacency in order at Murum, considering this Chinese company also clearly failed to spot the danger over where it was placing this dam in the first place? With so many cover-ups why should anyone accept the assurances by SEB’s CEO Torstein Dale Sjotveit that “Murum Dam is completely safe”?